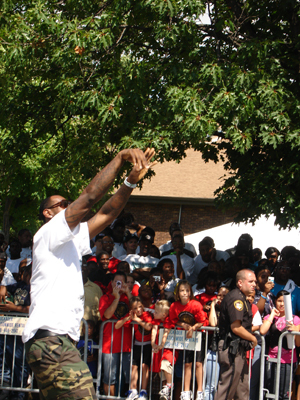 Parents and their kids braved the heat, forming a long line outside of the Summit Lake Community Center (SLCC) for NBA MVP LeBron James’ More Than a Game tour, sponsored by Nike. 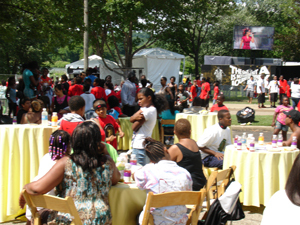 Free to all, the event held on August 21st included a large stage with performances by local acts, as well as free food, tattoos, games, shoe whitening, prizes and more. 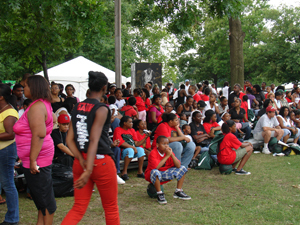 More than just fun and games, it was a call to action among the youth to change their lives, improve their neighborhoods and serve their communities. James and Nike saluted 13 Akron-area athletes for their work in the community. More Than a Game is a documentary that recounts how James and his friends pursued their dream of winning a national High School championship. Though facing challenges, the five soared into the spotlight when James got his big break. The film hits theaters October 2nd. 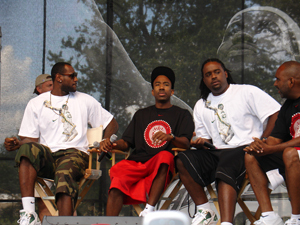 James and some of his friends featured in the documentary including, Dru Joyce III, coach Dru Joyce II and Sian Cotton, took the stage to talk about the message of the film. Though the event promoted James’ documentary, it was also held to recognize and reward Akron-area children who have achieved academic success, improved their physical fitness and made important contributions to the community. Director of the SLCC for 22 years, Audley McGill, took the stage briefly to talk about his work with Nike on the SLCCs’ volunteer program called Game Changers. He then introduced the Game Changers, a large group of adolescents. “They don’t get a lot of glory for it, but they do a good job,” McGill shouted in order to be heard above the crowds’ applause. James appearance at the SLCC was significant in that it was where he learned to play basketball at the early age of 7. McGill was James coach. Not only are they a recreational facility, but have a youth basketball program, day care, and other programs. “We do a lot not just for this community but city wide,” McGill continued, “There are so many different things, we could be here for hours just talking about it. You name it, we do it,” he continued. LeBron plans to help renovate the facility, expanding the gym and foyer area, and putting in locker and resource rooms. LeBron has teamed up with Nike for this reason. Other than being an all star on the court, James is passionate about two specific things. His annual “King for Kids Bikeathon”, held on the 22nd, highlighted that. “The Bikeathon is geared toward single-parent mothers and young African American kids in the inner city,” he said. 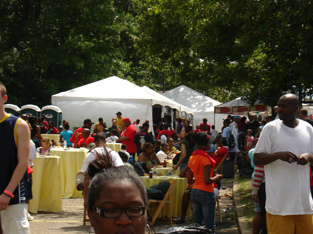 This year the event brought 1,100 riders together to raise money for the Akron Urban League and the Akron Area YMCA. “My whole passion is about inner-city kids and kids having a dream about becoming something more than what people think they can have – also single-parent mothers, which my mother was,” James told riders and spectators.